Charter students at the State Capitol March 13, 2019 at the advocate rally. A fight is on and Assemblymember Kevin McCarty (D-Sacramento) should be concerned, charter school leaders and advocates say. About 6,000 supporters showed up at the state Capitol in Sacramento recently to rally against four pieces of unfriendly charter school legislation, one co-sponsored by McCarty. If passed, school choice advocates say the bills could curb the growth of charter schools in California. They also fear the proposals could begin the dismantling of the existing 1,323 taxpayer-funded independent schools in the state. McCarty, who is African American, represents California’s 7th Assembly District, which includes Sacramento. He currently serves as Chair of the Assembly Budget Subcommittee on Education Finance. The California Charter Schools Association (CCSA) hosted the “Stand for All Students Rally” held on the grounds outside the Capitol. A number of speakers took to the stage to make their case against the charter school proposals and take aim at McCarty and the California Teachers Association (CTA) for sponsoring the bills. 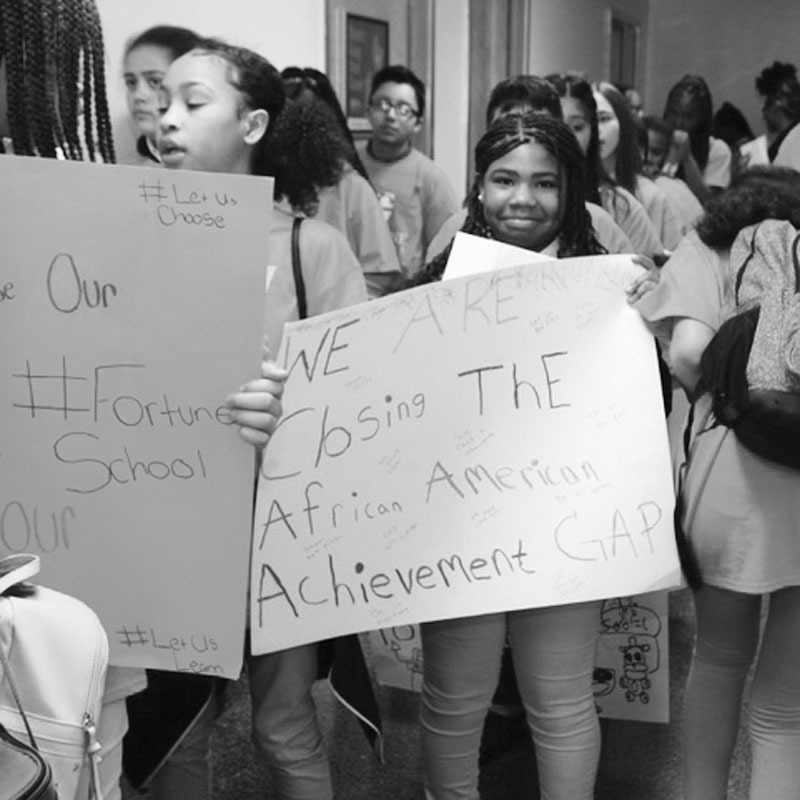 “Stand up, fight back,” a crowd of Fortune charter school students walked the hallways and chanted outside of McCarty’s office in the Capitol, expressing their concerns about his intentions to modify the way charter schools work. McCarty’s critics say the lawmaker did not greet or speak with the protesting students on the day of the rally. He later praised the students for being engaged but said he had a prior commitment. Charter school advocates also point out that the McCarty never met with operators or supporters of charter schools to ask for their perspective before sponsoring the bills. Former State Sen. Gary Hart, a Democrat who represented Santa Barbara in both the Assembly and Senate, authored California’s Charter School bill. It passed in 1992. He drafted it, partly, as an alternative to Prop. 174 which proposed giving all parents in California the option to use vouchers for tuition at private or church schools. Voters rejected that measure in the 1993 general election. Today, about 660,000 students are enrolled in the state’s charter schools. That number represents about 10 percent of the total public school population. According to the CCSA, Charter schools in the state enroll a larger percentage of African-American students at 8 percent than district schools, which matriculate five percent. The package of bills Fortune refers to and the ones CCSA opposes include AB 1506, which is sponsored by McCarty and Assembly member Patrick O’Donnell (D-Long Beach). The others are AB 1505, AB 1507 and AB 1508. AB 1505, also authored by O’Donnell, would eliminate all charter appeals and allow school districts broad discretion to deny a new or renewing charter. AB 1507 prohibits any charter school site from being established outside of its authorizing district. AB 1508 intends to allow school districts the ability to deny new charter petitions based on the fiscal, academic reasons and even the facilities of new charter schools. Officials from CCSA say the bills are “misleading, divisive, and premature.” CCSA’s President and CEO Myrna Castrejón suggests that legislation should be introduced to “benefit both sides,” public schools and charter schools. McCarty insists the bills are not designed to shut down charter schools. Getting ahead of the 4 bills, sponsored by the California Teachers Association, the CSSA is also sponsoring two bills aimed at achieving better results for Black students. The first is AB 575, authored by Assemblywoman Shirley Weber (D-San Diego), and the other is Senate Bill 614 or SB 614, introduced by state Sen. Susan Rubio, (D-Baldwin Park). AB 575 would increase funding and require greater accountability for the education of African-American students, specifically the lowest performers. SB 614, the Child Care and Development Act, would expand programs that offer services to students with disabilities. Fortune says her network of schools in Sacramento were created to address and close the African-American achievement gap, referring to the well-documented racial disparity in academic performance between White and African-American children. The controversial 1966 Coleman report, mandated by the 1964 Civil Rights Act, first revealed the stark racially-based differences in the country’s education system. “Schools that prepare kids for college starting in kindergarten would be shut down within two years,” she said. Gov. Gavin Newsom is also keeping his eye on the future of public education in the state and his ears open to the ongoing conversations. He recently passed a bill into law requiring more transparency and accountability in charter school operations. He also charged Superintendent of Public Instruction Tony Thurmond to lead an 11-member Charter Task Force to look into the details of charter schools financing. CBM reached out to the California Teachers Association for comment on the bill package but they did not respond as of press time.